Patriot Act extension: Mitch McConnell proposes continuing NSA's bulk data collection through 2020. 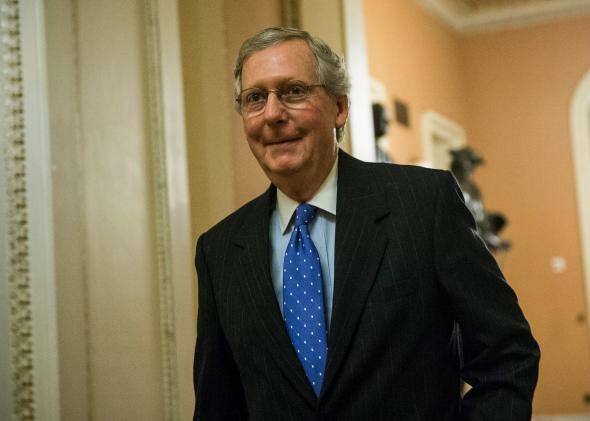 Mitch McConnell thinks Congress should do nothing at all to curtail government surveillance. Senate Majority Leader Mitch McConnell has a solution to end the contentious debate over soon-to-expire surveillance powers granted to the government under the Patriot Act. A new bill, co-sponsored by McConnell and Republican Richard Burr of North Carolina, and dropped on the Senate out of the blue Tuesday night, would put the matter to bed by locking in a controversial bulk data collection program, completely unchanged, for the next five years. The “straight reauthorization” offered by Burr and McConnell—renewing current law, as originally passed in the post-9/11 Patriot Act, without any new strictures—offers one end of that fence. On the other, Burr said, are the proposals that have been put forth by reformers such as Sen. Patrick Leahy (D-Vt.), ranking member of the Senate Judiciary Committee, and Rep. Bob Goodlatte (R-Va.), who as chairman of the House Judiciary Committee is putting the finishing touches on a reform-minded reauthorization bill. “I can’t tell you what the point is that we’re going to end,” Burr said, “but it’s somewhere between Leahy and Goodlatte and” his own bill. In the House of Representatives, where no bills have yet been proposed to address the expiration of the surveillance provisions, the news of McConnell’s bill was greeted with dismissal, bordering on contempt, from the GOP’s anti-NSA libertarian wing.